Management is firmly committed to a policy enabling all work activities to be carried out safely, and with all possible measures taken to remove (or at least reduce) risks to the health, safety and welfare of employees, contractors, authorized visitors, and anyone else who may be affected by our operations. We are committed to ensuring we comply with the Health and Safety at Work Act 1996, along with relevant Regulations and applicable codes of practice. Environmental sustainability is something that has now become of great importance due to the looming threat of climate change. 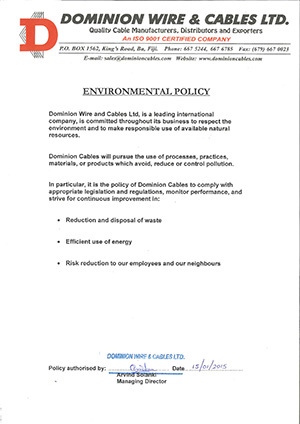 Dominion Cables acknowledges this and we have put in place policies to assure that our manufacturing processes do not violate or degrade our environment in any way. report all known or observed hazards to their supervisor. Take reasonable care of their health and safety while in the Dominion premises. Work safely at all times to protect themselves and those working with them. Report all hazards and incidents, including near misses, to Dominion Wire & Cables Ltd and in the event of an emergency follow the emergency evacuation procedures. Co-operate with management and workers on their duty of care under the Occupational Health and Safety at Work Act 1996. We seek the co-operation of all employees, customers and visitors. We encourage suggestions in realizing our health and safety objectives to create a safe working environment with a zero accident rate. This policy applies to all business operations and functions, including those situations where employees are required to work off-site. Management shall consult and co-operate with all Health and Safety matters as provided under section 27 of the Act and the Health and safety at work [Representatives and committees) Regulations,1997. This policy shall be periodically reviewed to ensure its efficiency and effectiveness. Follow and stay connected with us through our social media pages. You can also sign-up for our newsletter and email us if you require anything.